To see for yourself, try this outstanding FoV comparison tool. The easy: What one is interested in monitoring. If an area is not interesting, the FoV can be shifted or shrunk to concentrate on what is interesting. However, sometimes unintersting areas are mixed in with important ones so this is not always simple. The harder: The FoV's width is limited by how much details can be captured. For example, if you want to capture a license plate, this will force a narrower FoV than if you simply wanted to see if a car was present. In the old days, with analog, the appropriate width was somewhat set in stone. Now with megapixel, wider FoVs are possible. The good news is, with megapixel, you can go wider. The bad news is determining how wide is more complex. A camera/lens has a single angle of view (e.g., 80°, 40°, 20°, etc.) but the FoV width will continuously vary based on how far a subject is from the camera. 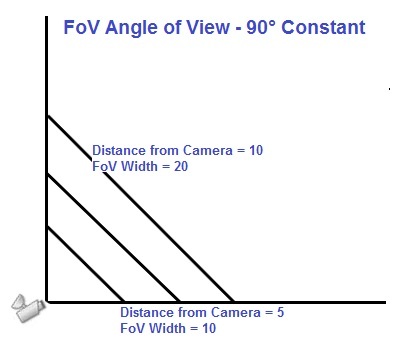 However, you also need to know the actual width of the FoV for where one's subject is. This depends on how far the subject is from the camera and the angle of view. This tells you the width. While this a key input (1), one needs to work back from that to the correct lens angle. To do so, you also need the (2) distance from the camera, (3) the imager size of the camera. For help calculating, review our lens / FoV calculator report. The lower you mount a camera, the more effective the image likely will be as the camera can see subjects straight on instead of the top of their heads. 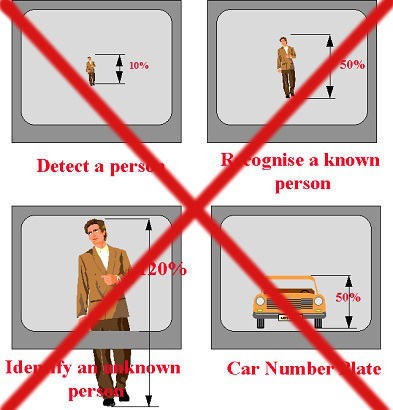 This is especially key if the camera is monitoring subjects close by. The higher you mount a camera, the less likely it will be tampered with or destroyed - a common consideration. If this camera is designed to monitor who enters or exits the door below, it is going to have major problems properly identifying individuals. However, if it is looking into the parking lot, farther away, it might do well. 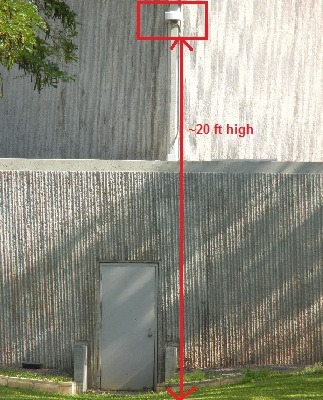 See this discussion about the average mounting height of surveillance cameras. Regardless of the number of pixels, if one wants to capture a direct face shot, the camera on the right will likely do a better job. However, this can be a practical concern even when cameras look relatively straight on to a subject. For instance, people's heads may angle one way or another depending on the layout of an area. A camera aimed just slightly the other way may miss direct head shots of many individuals. Monitor how people walk and adjust cameras to the natural flow. All of the above assumes you can mount a camera wherever you want. Of course, you cannot. Even worse, lots of logistical constraints routinely force cameras to be placed in positions that compromise video quality and / or increase costs. Read our Guide toLogistical Challenges for Camera Layouts.